Why (Else) is Xcel Energy Trying to Axe Minnesota’s Community Solar program? In a filing Tuesday (April 28), Minnesota’s largest electric utility announced unilateral action within the next 30 days to reduce development under the state’s community solar gardens program by 80%, from nearly 560 MW to 80. It’s the latest in a series of attempts to slow the program, including efforts to cap the program and impose out-sized fees in 2013 and insisting on alternative compensation scheme to the value of solar. Why is Xcel putting community solar on the chopping block this week? The heart of the issue is the cost to the utility, but also the issue of who is benefiting from community solar compared to utility procured solar. Xcel’s argument is interesting: community solar developers are “co-locating” 1 megawatt (MW) projects to capture economies of scale, but ultimately constructing arrays that seem to far exceed the 1 MW cap on community solar projects. Xcel argues that it could pay just 7¢ per kilowatt-hour for solar energy from utility scale solar in Minnesota (!) compared to payments in excess of 14¢ for residential subscribers to these larger community solar projects. Xcel’s proposed remedy is to prohibit the co-locating of community solar developments (ironically curtailing any economies of scale it says it values). Xcel might have a point about making utility-scale solar out of community solar, if the Commission hadn’t suggested last year (in September 2014) that it was okay with aggregating community solar installations at common interconnection points. The cost complaints must also be taken with a large grain of salt, because as happens frequently in the 21st century electricity system, the utility’s perspective doesn’t necessarily align with Minnesota electric customers. For starters, consider the purpose of community solar—to give residential and commercial electricity customers who cannot put solar on their own rooftop access to solar. The rates paid to solar subscribers might exceed Xcel’s wholesale price of solar, but community solar is meant to mimic a retail offset of electricity, not a sale to the utility. Thus the appropriate comparison is to net metering, and not Xcel’s utility procurement rate. The following chart illustrates the community solar subscriber payment—the “applicable retail rate” plus the Commission’s solar REC value (2¢ for large projects, 3¢ for smaller ones)—compared to the applicable net metering rate for each kind of eligible utility customer. When comparing apples to apples, the cost “premium” of a community solar subscriber is closer to 15% than 50%. And it’s important to note that the rationale for this solar REC premium was to help cover the overhead for recruiting and managing subscribers, a cost not borne by individual net metering customers. Community solar is also meant to encourage the decentralizing capability of solar energy, distributing the economic value of solar energy even as it makes the electric system more resilient by distributing power generation among many smaller power plants. Electric customers in the 21st century don’t have to rely on the utility for power generation, nor is it necessary—as it was with nuclear or coal fired power plants—to centralize ownership and control to raise vast amounts of capital. Community solar lets many more Minnesotans benefit from the economic decentralization of solar power. Payments to subscribers are reducing energy bills for residents and businesses, freeing up those dollars to spill into the state’s economy. That’s arguably better than signing a long-term power purchase contract with Florida Power & Light, even at a modest price premium. 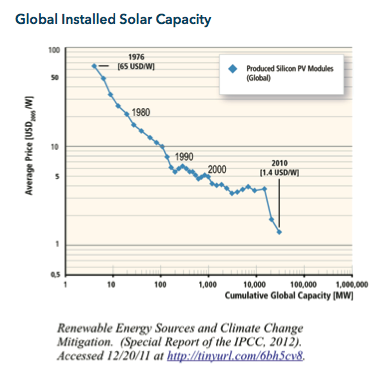 The value of solar, according to this formula, is 13.6¢ per kilowatt-hour. 2. 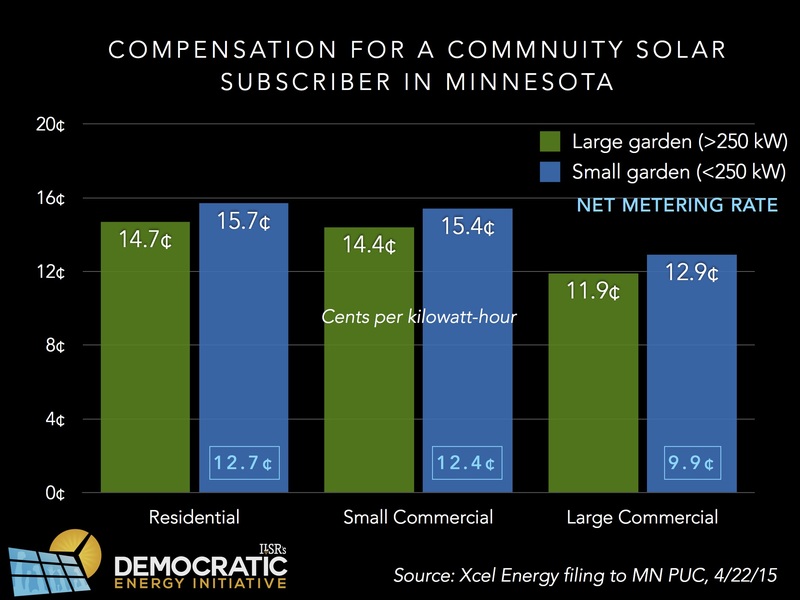 Residential and small commercial subscribers to community solar might be getting a bit more than the value of solar from their subscription, but large commercial solar customers—driving much of the community solar garden development—are getting less, suggesting that the net impact on Xcel is probably not that bad. 3. Xcel’s fight against community solar is likely rooted more in its competition to its 20th century business model than anything else. 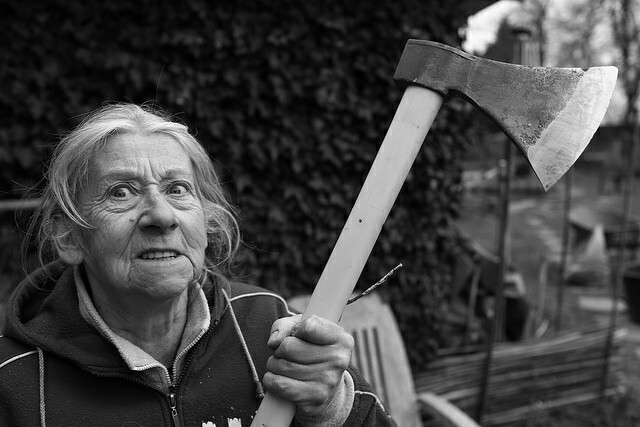 This article originally posted at ilsr.org. 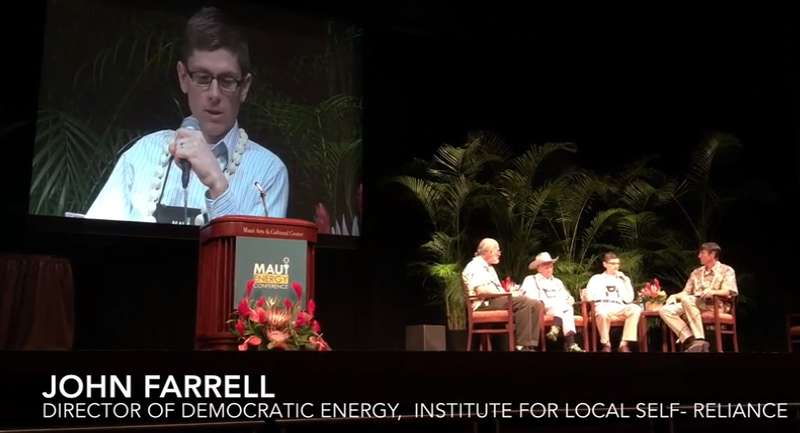 For timely updates, follow John Farrell on Twitter or get the Democratic Energy weekly update.